Home/Success Stories/Get Fit After 50 in Parkville! 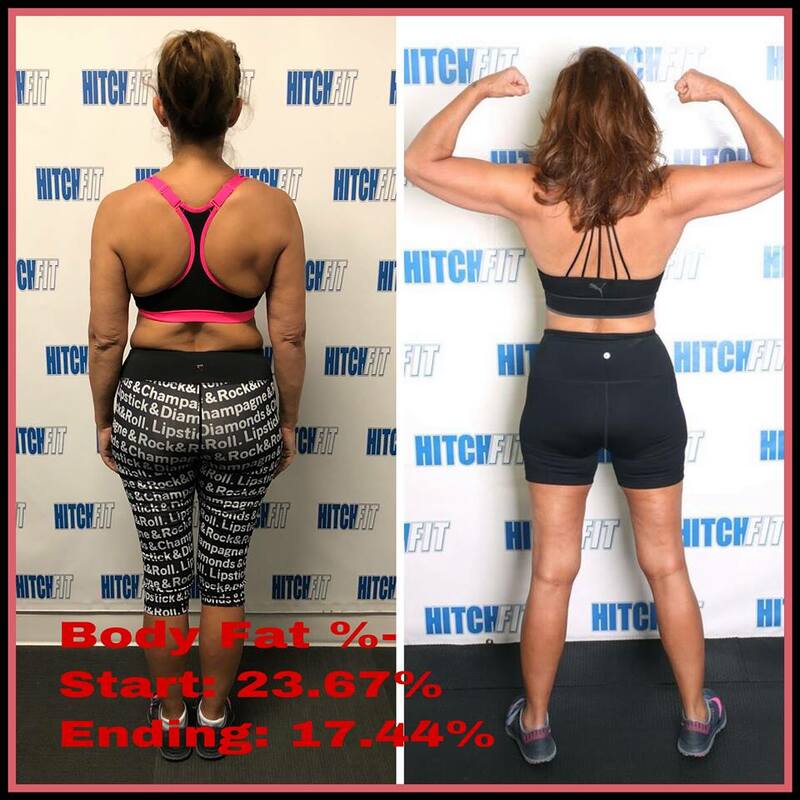 Shelley needed a confidence and energy boost when she decided to come to Hitch Fit! 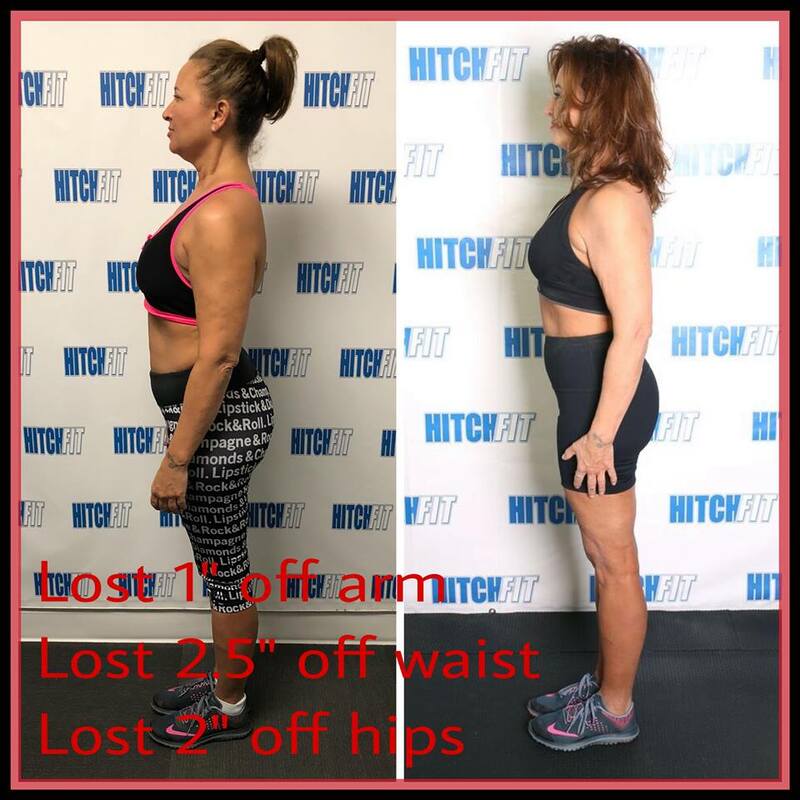 That all changed when she lost nearly 15 pounds and 6% body fat at age 51 with Hitch Fit Transformer Nancy Choquette! 1. How was I feeling about myself before Hitch? Before I was referred to Hitch, I was feeling pretty down on myself. I wasn’t watching my nutrition or as active as I had been in the past; and I wasn’t feeling very desirable- although I’m a very confident person. I hated taking the “before” pic, as I knew that was my reality not just physically, but mentally. 2. How was my Hitch Fit experience or feelings about Hitch Fit? Nancy was the perfect “fit” with whom I should train. I didn’t want a twenty-something telling me what I needed to do, as I didn’t think they would truly relate to me. Nancy (such a hottie) and I immediately laughed together, had a lot in common (except she was in great shape and I wasn’t) and she pushed me, knowing that I could do whatever I put my mind to doing. She not only taught me about nutrition and fitness, but she made me feel good about myself, which made me want to do more. I had some obstacles during my 12 weeks of training–but no injuries while training. I sprained a tendon in my left wrist, mildly injured my foot and got the stomach virus. I showed up, Nancy worked with me to do what I could -without injuring myself more- but without giving up. We pushed through and I feel great about my results, although I know this is just the beginning! 3. What have I learned that I can take with me going forward? I can do this! I want to do this! I’ve changed habits now that will stay with me as long as I stay committed. Nutrition is a MUST, add in regular cardio and weight training and I’m just going to keep getting better and defying age!! LOL (Hopeful thinking). I don’t feel my age, so I’m going to do everything I can to not look my age…which is just a number (how cliche’). I want to be “one hot momma”- as Nancy would put it- and Hitch Fit taught me and kicked me into gear! Thank you, Hitch Fit. Thank you, Nancy! I WILL be back for a check-in now and then if nothing more than to have you boost my morale and keep me both physically and mentally on track! Are you READY FOR YOUR TRANSFORMATIONwith Nancy Choquette at Hitch Fit Gym in Kansas City or Parkville? Or call 816-753-8900 and request to train with Nancy Choquette at our Downtown Kansas City or Parkville Gym Locations!